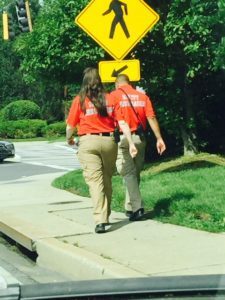 In May 2016, the Partnership collaborated with the University of Maryland Police Department and the City of College Park’s Public Services Department to launch a Pilot College Park Public Safety Ambassador Program. 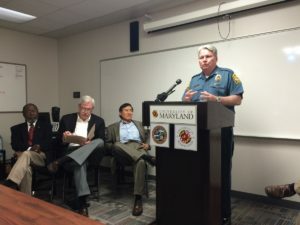 The launch event was attended by UMD President Dr. Wallace Loh, Senator Jim Rosapepe, Mayor Pro Tem Monroe Dennis, UMPD Police Chief David Mitchell, Testudo, the Partnership’s Executive Director, as well as members of the media and community. 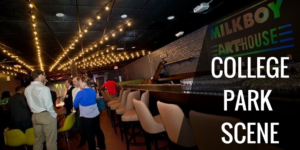 This pilot program is a collaborative effort of the University of Maryland Police Department, the City of College Park, the Governor’s Office of Crime Control and Prevention, and the City-University Partnership to build a safer College Park. Designed to enhance existing public safety services, safety ambassadors are highly-trained non-sworn public safety personnel who will focus on safety and hospitality. The pilot phase launched in the downtown area of College Park. Safety Ambassadors patrol in the public right of way and greet visitors, give directions, provide outreach to community members and visitors in need, report problems they see such as potholes, downed trees, streetlight outages and other hazards, and address nuisance crimes and other quality of life issues. To learn more about the recent progress of the safety ambassador program, click here for a status update.